Our first variant is Melchom - a.k.a. 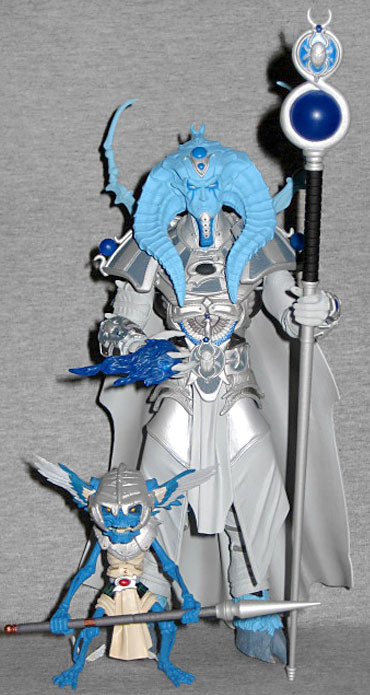 "Winter Fun Scarabus." Make all the fun you want of "Arctic Action" variants, they work for a reason: and that reason is that it's cool to see all the color drained from familiar designs, to appreciate them in a new light. 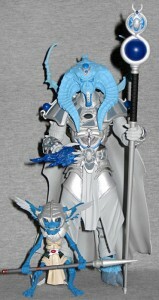 In this case, Scarabus's clothes are all white (or at least a very pale gray) and his armor is silver. The dark grey panels keep the design from washing out, too. His accent color - used for the gems, flames, etc. - is a very nice blue. His skin and fur are a bright powder blue, making for a nice contrast. His Timekeeper accessories are plain silver. 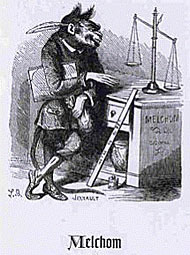 The name Melchom comes from demonology: he's mentioned in the 19th century Dictionnaire Infernal, which laid out the hierarchy of Hell; everybody had their own infernal role to play. So what's Melchom's sinister job? Does he heat the iron pokers, or feed you naught but burning hot coals? Is he the one that draws out your entrails, or climbs under your toenails like the Lamisil monster? Let's just check the book and... he's in charge of paying Hell's civil servants? Yeah, okay. EVIL! Maybe he makes them all turn their timecards in before the end of the day, so they're constantly getting shortchanged on overtime. Melchom doesn't just get a new face, he gets a new head. The face is slightly alien, with blank white eyes and a flat nose, and the chin stretches down to a crescent-tipped point. 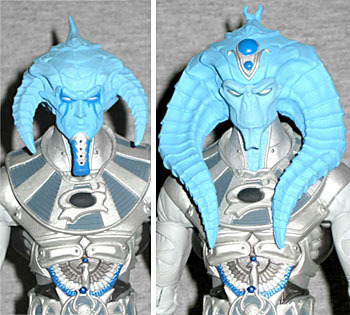 Just as with Scarabus, the face can be removed from the head, meaning this toy really has four different looks, not just two. 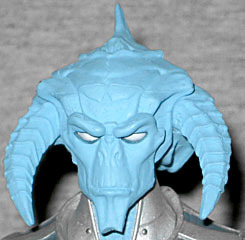 And going back to the Horsemen's original idea that all the variants of Scarabus were just him at different points in his personal timeline, the new head has all the same anatomical features as the normal one, just smaller: so if you put Scarabus' face on, you can imagine it's him when he was younger. His horns haven't grown in completely yet. The alien/demon look isn't my favorite among the Scarabus variants, but the colors are very cool - no pun intended.